Originally, interested men could show up at the door of a franciscan house, be admitted by any friar, given a habit, and sent out into the world as a follower of Francis, all in the same day. Talk about on-the-job training! With friaries accepting men immature in both faith and action, the pope at the time required Francis to organize a probationary year before new members could be fully admitted into the order, and gave only the provincial (essentially the president) the authority to accept any new members. Today, we witnessed that process as Dan Horan, OFM, and Steve DeWitt, OFM, took solemn vows and were fully accepted into the Order of Friars Minor. It was a beautiful ceremony (and due to the hurricane, a bit more intimate than expected), and a joyous occasion for these two friars who entered the order more than six years ago. It’s hard to imagine that six years ago, these two men were in my position, postulants, young and new to the order, attending some other friars’ solemn profession. It’s kind of cool that one of the first things we do is attend this ceremony because it gives us a glimpse of the “finish line,” so to speak. Obviously one’s solemn profession is by no means the end of the story or the “happily ever after” moment, but it is certainly the moment that all of us in the formation process are looking and working towards; the purpose of our formation is to prepare ourselves for a consecrated life, and that life “officially” begins at one’s profession. 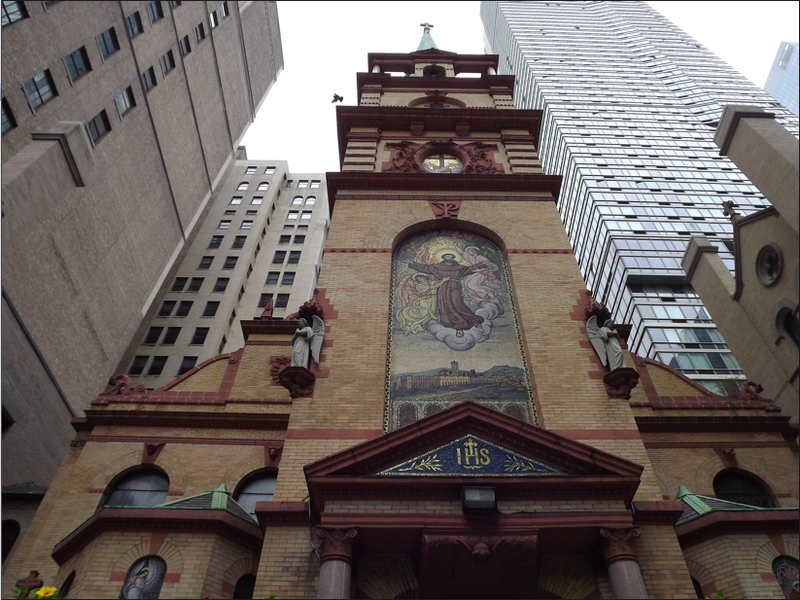 The ceremony took place at the mother church of the province, the Church of St. Francis of Assisi in Middle Manhattan. Home to one of the most beautiful chapels I’ve ever been to (don’t take my word for it, check out the pictures), it is one of two “service churches” in the province: the fifteen or so friars run nine daily masses every day (to accomodate the busy lives of New Yorkers), a morning breadline for the poor that has run since 1930, a counseling center, and a ministry list too long to mention. Because it is the province’s headquarters, it is host to many bishops, mayors and other elected officials, friars from around the world, and many other high profile people. Because of this, the friary is a bit nicer than one would expect for a Franciscan church, but the friars there would assure you that they own no more or less than any other group of friars, they are merely borrowing and maintaing the gifts given to them by the community they serve; it just turns out that the community in Manhattan is very different from the community in Camden, and their material space is a reflection of that. Also, Dan has a very popular blog and podcast (just what you need, something else to check) that you should check out: datinggod.org.